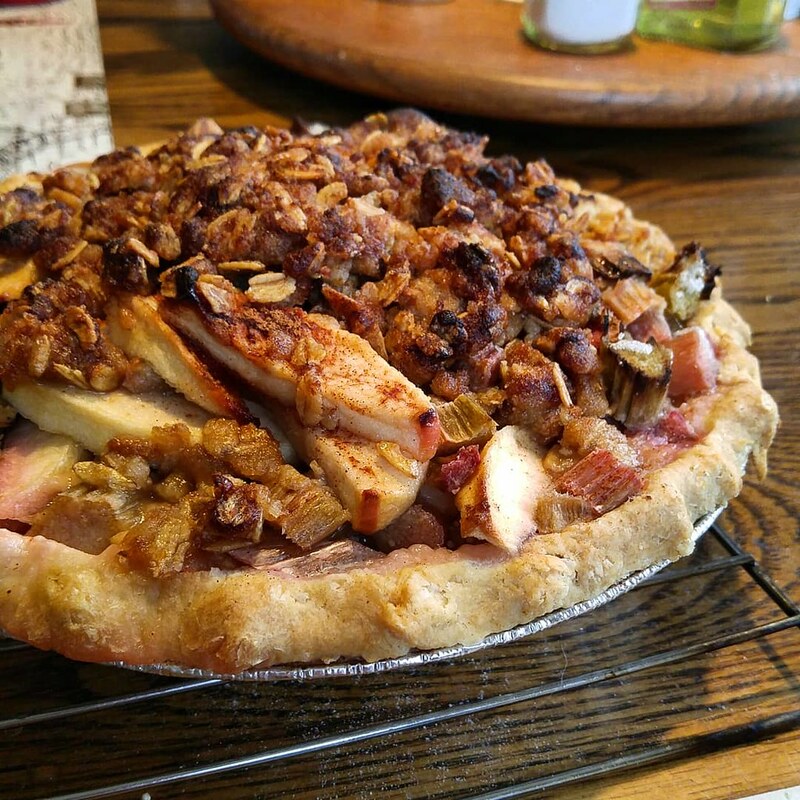 Apple Rhubarb Crumble Pie | What Smells So Good? Apple Rhubarb Crumble Pie is sweet, tart and the perfect way to use up your garden's bounty. I don't know about you, but my freezer is always full of frozen produce. We have the standard peas and cauliflower, but I also have hoards of cherries, peaches, mixed berries and rhubarb at my disposal should jam, pies or crisps need to be made. Of course, having a rhubarb plant in the backyard means I have to get creative and use up the rhubarb that's there before the next season starts! Without any (decently priced) strawberries, the standard jam or pie was out of the question. However, I came across a new rhubarb pie that is perfect for the cooler weather and super simple to make! While this pie is already easy (hello, no top crust!) 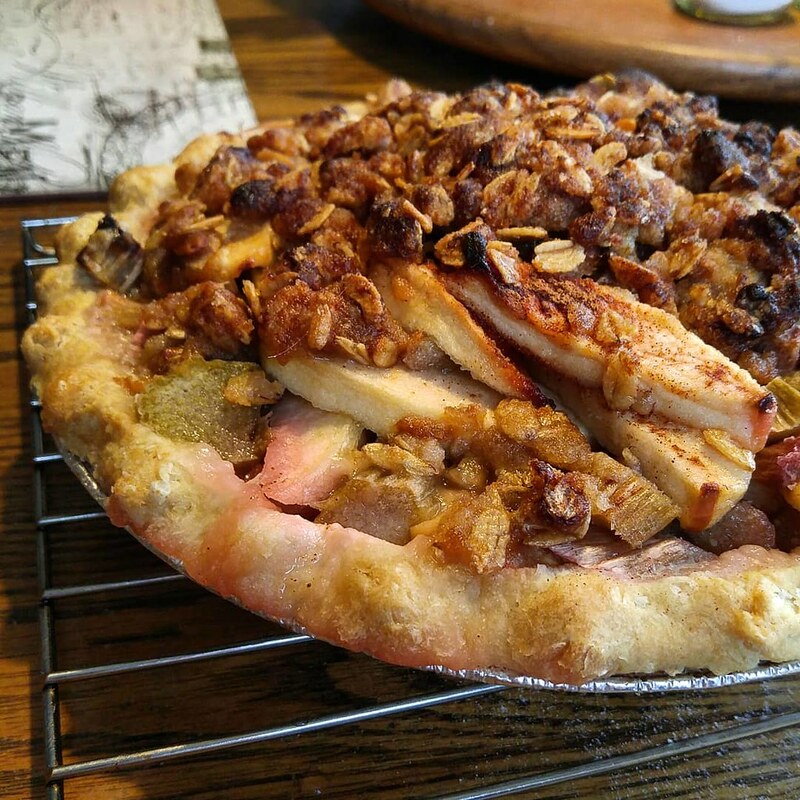 you can make it even easier with a press-in pie crust or even a storebought shell... I won't tell, promise! There are two keys to making this recipe sing - the honey / sugar syrup bath surrounding the rhubarb and apples, and the lightly spiced streusel with added apple flavour with the addition of apple juice. One caveat - you need to tent this one with foil. There is so much starch and sugar that the crumble will burn, and that's no fun! Letting the whole pie cool (as hard as it is) also lets all the pectins and starches do their work to set the filling, meaning beautiful slices. Whether you have a special occasion coming up (yes, even Valentines, or anti-Valentines Day!) or just want a delicious dessert for a weekend dinner, you can't go wrong with this. Plus, in the Spring when rhubarb begins to grow again, this pie works just as well! Just toss the rhubarb with the sugar and let stand for an hour before proceeding. Roll out and fit pastry into a 9" or 10" pie pan, set aside. In a large bowl, toss together the "filling" ingredients until well combined. Pour into the pie shell and set aside. In another bowl, combine the oats, flour, salt, brown sugar and nutmeg. Cut in the butter to make coarse crumbs. Drizzle in the apple juice while tossing gently with a fork until a crumbly, moist streusel forms. Sprinkle pie filling with the streusel, patting down gently to adhere. Place the pie on a baking sheet to catch drips and place on the bottom rack of the oven. Bake for 10 minutes. Reduce oven temperature to 350°F. Bake for 30-35 minutes, tenting loosely with foil after 20 minutes.